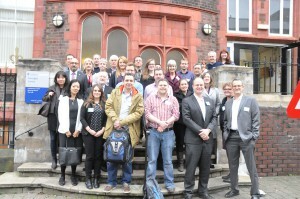 This month saw a swarm of parasitologists, entomologists, virologists and ecologists descend on the University of Liverpool for the second conference on ‘Vector-Borne diseases (VBD) in the UK’. Recent years have seen vector-borne diseases in Europe increase in range and disseminate into new environments. New viruses such as Bluetongue and Schmallenberg have emerged,two human cases of the important tick-borne disease Crimean-Congo Haemorrhagic fever virus (CCHFV) were imported into the UK in the last two years and the natural tick vector species Hyalomma marginatum, came into the UK via migratory birds. Due to the recent changes in legislation no longer requiring animals to be tick treated when entering the country via the PETS travel scheme, ever-increasing human and animal movements and climate change effects, the UK may be at heightened risk of vector-borne disease incursion. This conference was a unique opportunity to bring specialists from different fields together to discuss vector-borne research in the context of the threat to the UK. The two days were divided into six themes; biting midges, ticks, mosquitoes, the European perspective, other vectors and new technologies, with talks delivered by scientists and policy makers.Within the themes a variety of topics were covered linking together research on vector surveillance, environmental and climatic variables, the effect of resource availability on vector biology and specific pathogen-vector-host interactions. Dr Simon Carpenter (The Pirbright Institute) opened the first session introducing surveillance and dispersal studies of Culicoides spp. (the vector group responsible for Bluetongue virus (BTV) transmission) by means of light traps and egg protein-based capture-mark-recapture techniques.Working with the Met office these results have generated dispersal and movement maps which serve as a useful resource for outbreak modelling. Dr Beth Purse (Centre for Ecology & Hydrology) highlighted the importance of environmental variables in arboviral (arthropod-borne virus) disease, describing a resource based habitat concept to determine what the important resources for a vector species are and where these resources are located thus enabling the prediction of areas where pathogen–vector interaction is likely to occur in the context of a BTV outbreak. Preliminary data describing the current distribution of UK ticks was also presented,with emphasis placed on the importance of this information in determining the likelihood of tick–human contact and the potential for disease transmission. The role of Green space – that is used for recreational activities in urban and semi-urban areas – was investigated in terms of tick distribution and pathogen burden. Kayleigh Hansford from Public Health England (PHE) and Dr Richard Wall from the University of Bristol both presented studies on Ixodes ricinus from various locations in the UK. Both studies found that ticks were most abundant in woodland and woodland edge habitats frequently used recreationally by humans. Both studies also identified new pathogens not previously detected in the UK: Borrelia miyamotoi and Babesia gibsoni. Dr Richard Birtles (University of Salford) then highlighted the importance of bringing together the medical, veterinary and scientific professions in a ‘one health’ approach in the case of Lyme disease (LD), a key message echoed by several speakers throughout the conference. A qualitative investigation was undertaken using questionnaires to assess the knowledge of LD amongst GPs and which LD symptoms were most commonly presented to them in suspected hot spot areas of South Cumbria. There were some interesting outcomes, one of which reiterated that Borellia burgdorferi (the causative agent of LD) manifests itself in two forms: the arthritic form and the neuroinvasive form. However, responses obtained indicated that only patients presenting with the arthritic form are diagnosed as having LD. This therefore highlights the importance of continued information dissemination within and across the public and professional domains. The use of novel techniques to investigate pathogen-vector-host interactions was another area extensively discussed. For example the successful development of a high containment in vivo tick feeding model to investigate vector competence of ticks to CCHFV was presented, as was the use of cell lines to study arbovirus replication and molecular mechanisms of Chikungunya viral pathogenesis. Dr Clive McKimmie (Glasgow University), using a novel in vivo model system, illustrated that the role of the mosquito bite is more than simply a means of transmitting a pathogen. As a result of the complex biochemical make up of mosquito saliva, innate inflammatory immune responses were induced at the site of the mosquito bite, allowing the virus to spread more efficiently from the bite site and invade neural tissue faster, leading to more severe disease. This work adds a further layer of complexity to the interplay between pathogen, vector and host and could in future provide a new target for the treatment of arboviral diseases. The ability of pathogens to manipulate the behaviour of their vectors to their advantage was a theme explored by Dr James Logan (LSHTM). He described how Anopheles gambiae exhibited increased attraction to human odours when infected with Plasmodium falciparum, the parasite responsible for causing the most severe form of malaria. Studies in purpose-built wind tunnels demonstrated that this increased attraction was most evident in the later, infectious stages of parasite development within the mosquito when a bite would be most likely to infect a host. This approach ensures mosquitoes avoid potentially fatal host defensive behaviours associated with bloodfeeding until the chances of parasite transmission are maximised. Luke Alphey (The Pirbright Institute) brought the conference to a close with some very positive results from trials using genetically modified mosquitoes to suppress populations of dengue virus vectors. Using a technique termed RIDL (Release of Insects carrying a Dominant Lethal), genetically ‘sterile’ male Aedes aegypti, whose offspring are unable to survive until adulthood, were released into defined urban areas in Brazil and the Cayman Islands.The field trials achieved an impressive species-specific population reduction of up to 96%, and importantly, these results were accompanied by extremely strong support from the local communities concerned, setting the groundwork for more extensive studies in future. There were also a vast number of interesting posters including studies detailing the biting behaviour of farm-associated mosquitoes in the UK, understanding the risks and factors associated with the introduction of CCHFV into GB and targeted inhibition of arbovirus replication in mosquito-derived cell lines, to name just a few. The conference was preceded by the inaugural meeting of the newly formed Health Protection Research Unit. This was established in April 2014 using funding from the UK Government’s National Institute for Health Research (NIHR). This is a collaborative project between Public Health England, The University of Liverpool, and the Liverpool School of Tropical Medicine in order to promote a ‘One health’ approach to emerging infections and zoonoses.